We took a weekend Adirondack cruise through Old Forge, Inlet, Tupper Lake, Saranac Lake, and Lake Placid -- a very nice route for upcoming Leaf Peeping! 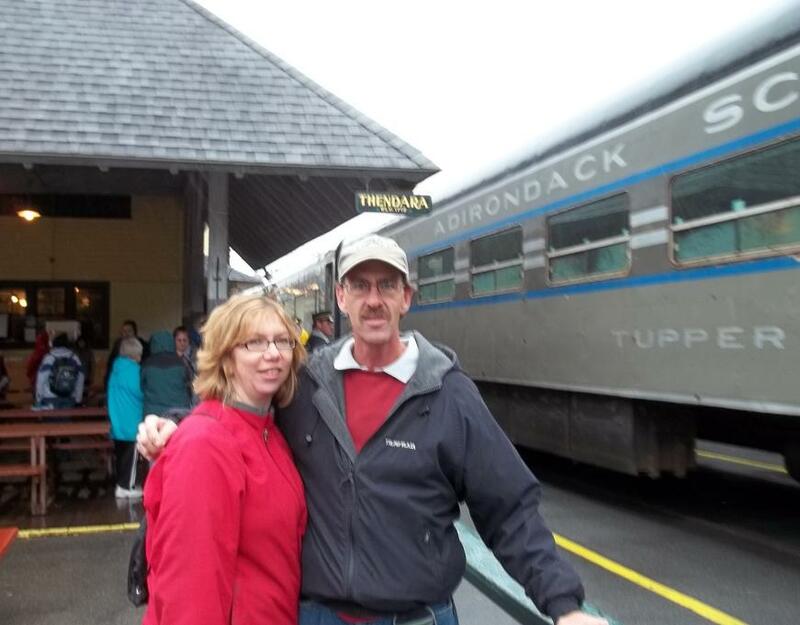 We spent a gorgeous, if chilly, fall weekend on a whirlwind tour of New York State's Adirondack Park. Up in those mountains the leaves have already begun to change, and will likely peak during the next two weeks. You might enjoy retracing our route. The views along the way are spectacular as you pass a seemingly endless series of lakes and peaks. We had Old Forge in mind as a way-point before we began our tour. The quick route there, still scenic, is to head northeast from Utica (Thruway Exit 31) via state routes 8 and 28. 28 enters the southwest corner of the Park in Lewis County and quickly passes into Herkimer County. It's a good road, well-traveled. We found Thendara first, just west of Old Forge, and stopped there to check into the scenic train tours offered (we'll be going back!). Behind the station/train museum lies a beautiful white plantation-style mansion offering food and lodging. We grabbed brochures and pushed on to Old Forge, a short distance up the road. No question Old Forge, which marks the western start of the Fulton Chain of Lakes, is a destination. This once-quaint town, now home to Enchanted Forest and Water Safari, bustled with activities when we arrived around lunchtime. We'd just missed a tour boat departure, and were too early for a big parade. The local restaurants were mobbed, so we kept going. We followed Route 28 along the northern shores of the first three Chain lakes, thru Eagle Bay (pretty quiet) and descended into Inlet, on the eastern edge of Fourth Lake. This was Fall Festival weekend, so Inlet was hopping, too. We parked in a very crowded village lot and found one restaurant that was about to close and another that wasn't open yet. One of the locals pointed us uphill a mile or two, to Drake's Inn. At Drake's we found original 1950's decor, college football on two TVs, a nice waitress, and two very tasty fresh-haddock sandwiches. Bellies full, we had to decide between returning to Old Forge or pressing deeper into the Adirondack Park. It was still early on a lovely day, so we pointed the truck toward Blue Mountain Lake. Along the way, still on 28, we passed the 6th through 8th lakes in the Chain. I pointed out the state campground where I had stayed twice, more than 25 years ago. Route 28 wanders past Raquette Lake, then skirts along the southern shore of Blue Mountain Lake. Both are very pretty, offer some rustic accommodations, plus plenty of boating and camping opportunities. We stopped briefly to read about the State-owned islands there, then continued on in search of something a bit more touristy, like a motel-on-the-lake or something. We followed 28N (north) through Long Lake and onward to Route 30. Long Lake actually seemed quite nice, but we hadn't heard of it before and weren't prepared to stop at that point. We saw at least two good lake-motels that probably would've been fine, had it been later in the day. I had, however, heard of Tupper Lake (skiing? yes); so we set that as our next way-point. Alas, Tupper Lake proved a bit disappointing. We didn't see much of the lake there, the town wasn't aging well, and it was way too early in the year for skiing. Up the road a fair pace (about 20 miles) was Saranac Lake, which we suspected might offer more in the way of weekend-tourist attractions. With the day quickly shortening, we hopped onto Route 3 for the journey to Saranac Lake. The drive there feels longer than it looks on the map, with plenty of ups and downs among the twists and turns. The distant peaks were sharper, the trees taller, and more lakes or ponds appeared along the way. The lake itself is well-hidden in the valleys west of Route 3. It's a good-size lake with dozens of islands and bays; but the "little city" of Saranac Lake would be described more correctly as sitting atop Lake Flower. Should we stay in Lake Placid? 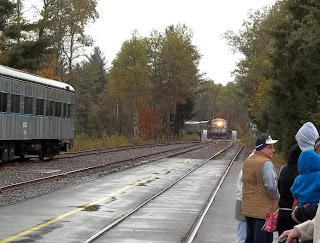 Although we were less than 10 miles from Lake Placid (certainly a much larger tourist attraction), we saw enough potential in Saranac that we decided to stay. Business was brisk at the many motels along Lake Flower Avenue (Route 86), but we found a nice room close to town at the Lake Flower Motel. There we booked a clean and comfy room for about $100. The decor there dated from the early 50s (pink and black tile, cast-iron tub) and was perfectly maintained. We left the truck there, and took a long walking tour of Saranac Lake. It's a college town (North Country Community College) that dates back to before the turn of the century. Historic downtown buildings mix with newer construction and quite a few small pubs. It was nearly six pm, and many of the stores we passed were closed. We found another scenic railway station/museum (pretty impressive building), located on Depot Street. The timing was all wrong, or we might have considered a railway sojourn. Back at the motel, we sat for a bit on the grassy beach and relaxed in the atmosphere of small boats and big lakeside houses. Saranac doesn't seem to offer any lake tours, or we might have booked a cruise. Well-rested after our downtown hike, we decided to zoom down to Lake Placid, just to have a look. Now, make no mistake, Lake Placid is one boomin' tourist town. As a former Winter Olympics host (1932 and 1980), the town is filled with wonderful sights, expensive hotel rooms, and alluring steakhouses. Not to mention people and cars, everywhere. We oohed and ahhed, but the sun was setting and we were reluctant to make the winding drive on Route 86 back to Saranac Lake in the dark. The pickin's were slim for dinner in Saranac Lake. We passed a very popular BBQ joint along Lake Flower (not what we had in mind), and passed-up a couple of other establishments closer to town. Judging by the number of cars in the lot, we decided to have dinner at The Nona Fina Pasta Grill just across the road from our motel. I'm no gourmet, but I'd give this old-world Italian restaurant five stars for both food and service (Google shows 4 ½, actually!). Prices were quite reasonable, too. We were warm and cozy in our vintage motel room that night, while the clear mountain night air dropped down to about 30 degrees (much colder than we've had here in Fairport). Morning on Lake Flower dawned crisp and foggy, with wisps of vapor rising off the mirror-finish water. I sat on the dock with a hot cup of coffee to warm me, and found a friend in one lone duck that raced over to keep me company. She was probably hoping for food, which I didn't have yet, but she stayed next to me by the dock for at least 15 minutes, close enough to touch. We chose a different route home, using Route 3 west. It's the main east/west passage up there, with smooth pavement and wide shoulders. We passed a few more lakes and peaks, and quickly enough left The Park west of Cranberry and Star Lakes. If you long for a restroom or gasoline up there, be sure to stop at any place you see on Route 3; there isn't much until you get closer to Watertown. In the end, I'd prefer to have booked an extra day for hiking or a train ride or lake cruise. 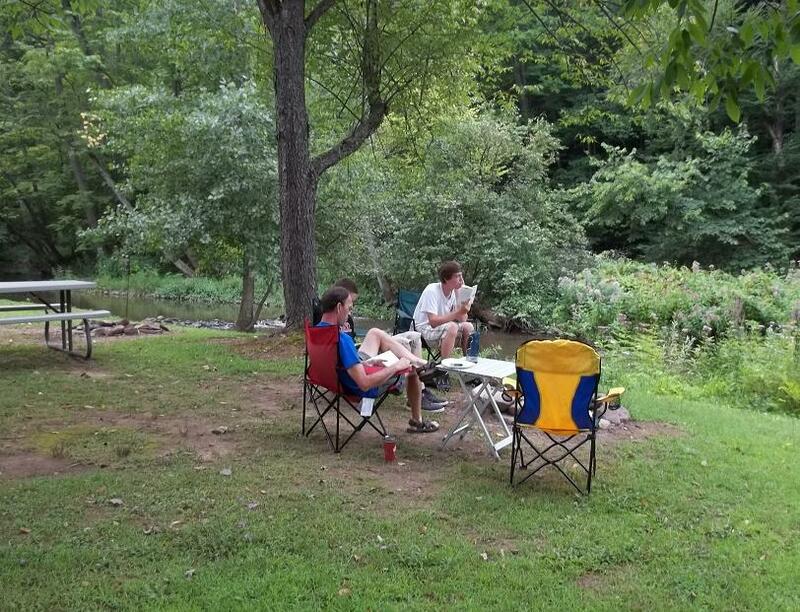 For those who love camping, fishing, or boating the possibilities are nearly endless. Realistically, we had only a glimpse of what the Adirondack Park offers. That's how whirl wind tours go, of course. If you plan a "leaf peeping" trip during the next few weeks, be sure to check ahead for accommodations. The No Vacancy signs will be lit up everywhere. For information on Saranac Lake, ranked #1 Best Small Town in NY State, call their Chamber of Commerce weekdays at (800) 347-1992. Several excellent print publications covering the entire region are also available to supplement whatever you might find on the Internet. 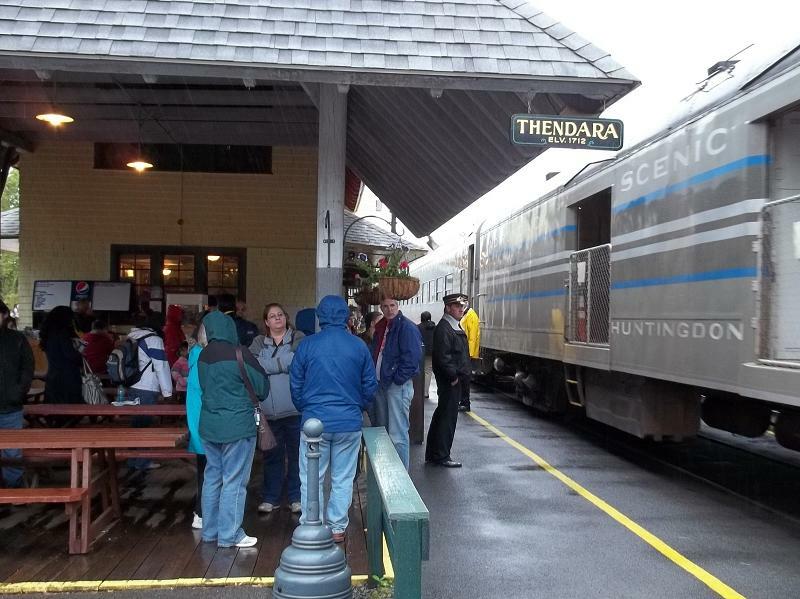 Read all about our return trip via the Adirondack Scenic Railroad. I highly recommend the ride! If you do go, and find any good lakeside motels or more good restaurants, please stop back and let me know. 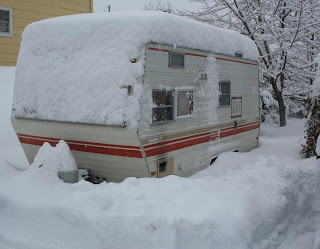 Rochester's Dome Arena RV SuperShow brings a hint of Spring to the Camping World - Free Admission! PRESS RELEASE: 15th Annual Dome RV SuperShow runs Saturday, Jan 21 to Sun, Jan 30 -- two full weekends of camping fun! Some say that Spring is just around the corner, and the show to prove it is just down the road in Henrietta, NY. The Outdoor Store by Camping World hosts the big event, held in the renovated Dome Arena. Admission and parking are both free. There are plenty of restaurants, coffee shops, and accommodations nearby for those who want to make it an all-day event. 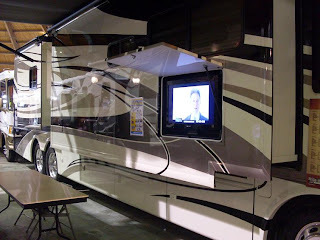 About 200 new and used RVs will be on display, and available with deep pre-season discounts. Several area dealers will be represented. Low-rate financing is featured, and dealers claim they'll take "almost anything" in trade -- motorcycles, boats, cars, even used RVs! When we visited on Saturday, we saw quite a few deals in progress; always a good sign. You'll see the complete range of campers, from Class-A motorhomes and fifth-wheels in the big dome to the newest innovations in pop-up and trailer technology in Minett Hall. Starcraft is promoting a couple-sized travel trailer for under $10K, or less than $90 a month (long-term financing). You can also register to win this model. The Thor brand shows a 23' 2011 Class-C Four Winds camper for about $50K, an often-difficult price-point to find in new RVs of that type. Outside in the cold, rows and rows of used rigs of all types await you. Come for a leisurely stroll, or an intensive buying excursion. Bring your camera and/or your checkbook. The RV industry is cautiously recovering from the disastrous Great Recession (it ain't over yet), and there will be big bargains. Haggling welcomed, even encouraged. Refreshments available on-site. For directions and lists of nearby accommodations, see the Dome's website. Hours are Mon-Sat 10 am to 8 pm, Sunday 10 to 5 pm. On-site parking is much improved from previous years, and there's a nifty new Wegman's supermarket right next door, too. We stopped over midday Saturday, and took some pictures to share later. The Dome's just down the road from home, and is also the site for WBEE's twice-yearly Guitars and Stars Shows, which we love. We aren't in the market this year, but we sure do love to look at all the shiny new RVs. Nice that admission is free, too. It's cold and snowy here in Rochester, but nice and toasty inside the Dome. Great show! Raymond Alexander Kukkee and I agree -- "we like camping better." But camping isn't perfect; some things could be better. 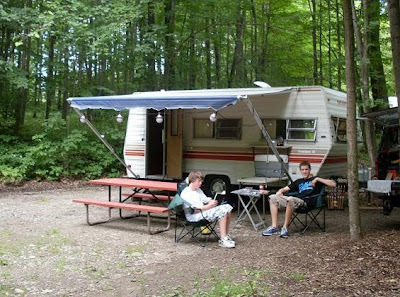 The New Year is here, it's 2011; time to consider improvements we'd like to see for a better camping experience. Low-price Late Check-out fees ~ Why should your final day at a campground be spent frantically packing? For weekend campers, this means Sunday morning is not for relaxing, but for breaking camp. If there isn't anyone coming in to take your site that day, why not a simple $5 late check-out fee? Hell, even $10 would be fine. Just let us relax a little before we head home. Kinder, gentler pool-use policies ~ Yeah, yeah; we know it's all about the Insurance Companies. We get it. But "Two adults must be present, not IN the pool, for any swimming"? When my son and I camped during the week last year, this meant that we had to FIND HELP in order for either one of us to take a dip. There has to be a better way. Much better use of photography for campgrounds ~ Let's face it: most campground websites' photo galleries just plain stink. Why don't you guys take some new pictures? Why aren't there decent aerial views of most campgrounds? What happened to the promise of hi-tech "virtual tours" for travel destinations? Maybe some of the big-budget RV parks are doing it, but I haven't seen any progress here in upstate NY yet. We want to know what we're getting into before we get there, okay? Better miniature golf course maintenance ~ Our gang always plays mini-golf when we go camping. It's one of our things. Even at the nicest campgrounds, those little golf courses are generally crummy. Why? They made the space, put some money into it in the beginning, and then walked away? I know they aren't huge money-makers for campgrounds, but it matters to us. If the windmill is supposed to turn, it should, dammit! And how about some fresh "turf" every few years? Is that too much to ask? More patio pull-thru sites for big rigs ~ What a great idea: Add a simple concrete or paver pad next to the pull-thru driveway for Class-A motorhomes. Maybe a nice picnic grill, too. I've seen this here and there. Most places insist on "no carpets" and fight with campers about infractions all the time. This nice, thoughtful improvement makes the campground look good and solves the dead-grass issue perfectly. Reasonable prices for firewood on-site ~ We're a captive audience, and most parks have those annoying signs urging us not to bring in "contaminated" firewood from outside the area. They don't want us to burn construction debris, either (not that I pay any attention -- I save all sorts of lovely hardwood and softwood cut-offs all year long for burning). So, if they want us to buy their firewood, keep the price down. They'll sell more firewood, and their customers will appreciate the courtesy. Dependable Wi-Fi ~ How many times have you lost the signal when you access the Web while camping? If a campground is going to offer internet service, then make it good. Buy a decent router and install a strong repeater system. Campers will talk about the great signal strength among their friends. It's just plain good for business. Good, hot, drinkable coffee at camp stores ~ Why is campground coffee so bad? Is there a secret rule somewhere? Clean the pot. Buy some decent coffee. Use a coffee service, even. We campers love our coffee, and we don't suffer bad coffee quietly. Pretty please? Simple, easy, quiet air mattress inflation ~ There must be a way. I'm serious. Are you listening out there, Inventive Geniuses? Those annoying, whiny, slooow DC-powered mattress pumps are so old-tech. There must be something out there similar to the way a life-raft inflates, something affordable that would fill up a queen-size bed in 20 seconds. I'd buy it! Improved tent-flap zippers ~ Needs no explanation. We've all been there. So that's my list, large and small. Some pet peeves, and some wishful thinking. I'm not asking for cleaner restrooms, or actual hot water in the showers, or big discounts for repeat customers. Just some give and take to make our collective camping experience better for 2011. I don't think I'm being unreasonable, do you? What are your ideas for Better Camping? What drives you crazy when you're camping? What nifty invention would make your next camp outing cooler? If you're a campground owner, I'd especially love to hear from you. Happy New Year!